On Saturday, May 27th one of the most vibrant and happy souls in our lives went with God to her true forever home and led the way ahead like she always enjoyed doing. After dashing ahead Ruby would stop and look back at you with her huge grin that just had to make you laugh. On that Saturday Ruby dashed ahead once again, and while it will seem like forever to us right now, we will soon see that same wonderful smile on her face asking what took us so long to catch up. It was three years ago that "auntie" Cate Norton contacted us to ask if there was any way we would consider taking in a third NERR pup as a foster at 11 years old. While trying to make a decision we had several people tell us that "Three dogs are too many", or "You don't really want to take on an 11 year old dog do you? ", and so on. Despite the comments we decided to open our home and hearts to the wonderful Miss Ruby (RubySlippers, Ruby Duby Doo). There has not been a day since picking her up from "auntie Marian" in NH that we have ever questioned our decision. 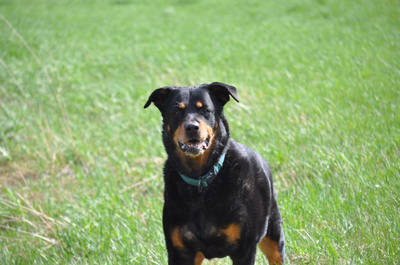 While we initially thought we would be helping her during her "senior years" we have come to find that it was feisty Ruby showing us how to live each day with a smile on our face and to be young in heart. Ruby is one of the happiest pups you will ever meet. True to her advertising on the NERR website she was a "cheerleader", dancing around her brother and sister when they would run or play barking at them to make sure they knew she was there to play too. 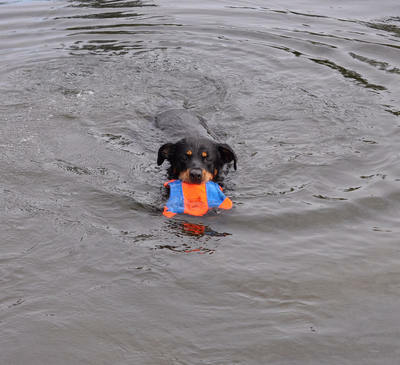 She was fearless chasing them at full speed, or diving into the pond to race her brother to the floaty toy. She never walked anywhere, instead always trotting around with the biggest smile on her face, ears bouncing and her little tail going a mile a minute. 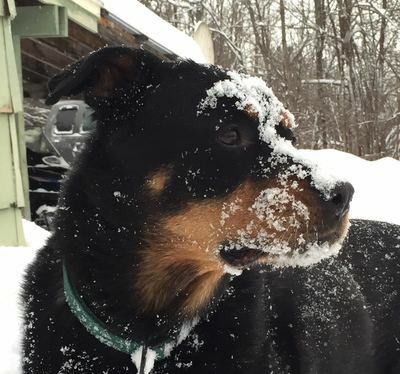 She truly believed she was a two year old puppy, and had the heart of a lion. She had an incredible love of life and lived it on her terms - full speed ahead. 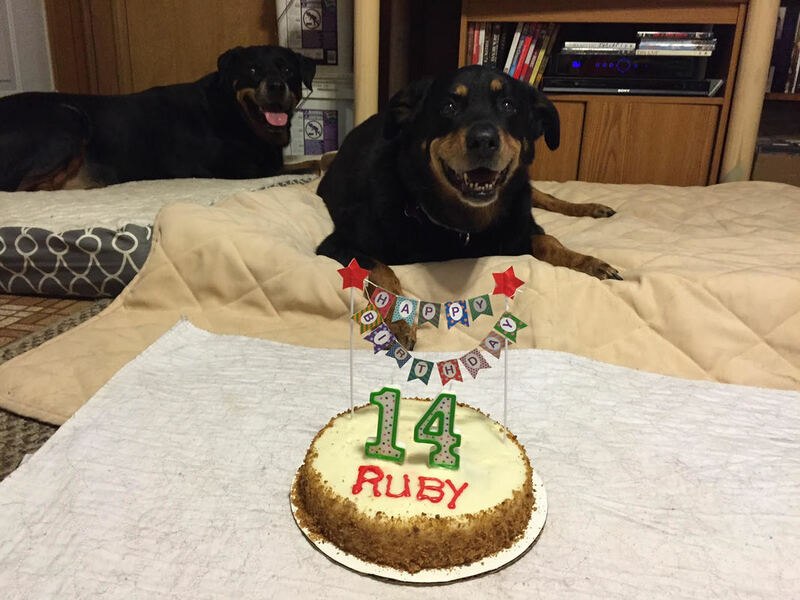 On May 15th we celebrated with Ruby the tremendous gift of her 14th birthday. Like her birthdays in the past, she enjoyed a special dinner (KFC this year) that was of course followed by a cake and ice cream. And yes, she did share some with Bella and Chance, and we have the pictures to prove it. While she had slowed down a bit from her "puppy" years due to arthritis in her spine, she was still very active and gave her brother and sister (and mom & dad) all they could handle with her sassy attitude and positive spirit. No one could believe she was a 14 year old. She was the very example of what a positive attitude (trust us - she certainly had attitude) and a "will-do" spirit can do. It truly seemed like she would outlive all of us. Unfortunately, we were shocked by Ruby having to leave us the same way she lived, quickly dashing on ahead. After having a great day, we relaxed with the whole family watching some tv and settled in for the night. About a half hour later Ruby sat up at the end of our bed and looked at us with just a small bubble on the side of her mouth and looking a little nauseous. I quickly took her outside. Ruby suddenly showed signs of distress and attempted to vomit but nothing came up. We took her to the emergency vet in Burlington right away. They quickly determined that she was suffering from GVD (she had bloat and her stomach was twisted). Knowing her health was otherwise still very good with a fighting can-do spirit we elected to have the surgery immediately to correct the problem. Within minutes our hearts were broken when the bloodwork showed that the lack of blood supply had already caused damage to her spleen and some of the stomach tissue as well. The chance of complications for the surgery was very high, and there would be a tough road ahead even if the surgery was successful. While I would never want to give up on trying to help our sweet girl, we both knew that Ruby would never be happy not living life on her terms - full speed ahead. In less than 60 minutes from having a normal happy girl headed for bed we had to say "goodbye for now" to our amazing Ruby and let her go over the rainbow bridge with God. We took time to give her lots of scritches and let her know how much we all loved her, and how grateful we were that she chose to be a part of our family for three truly amazing years. Then, our fearless Ruby dashed on ahead, and will be looking back waiting for us with that great big smile from her new Forever Home. While we know that Ruby is still always here with us, and that we will certainly see her again, it breaks our hearts to not have that happy smiling face looking at us each day. Both Bella and Chance are clearly mourning the loss of their sister Ruby, making the quiet in our house all the more noticeable. Ruby was such a life force and a presence wherever she went that it is impossible for anyone to not recognize that a very large and wonderful part of our family is no longer with us. While it may be out of place in a tribute to Ruby I urge anyone who is lucky enough to have a Rottie in their lives to please learn about Gastric dilatation-volvulus (GVD). 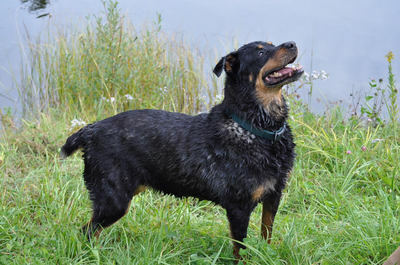 It is the second leading cause of death (after cancer) in large breed dogs with deep chests and narrow waists. While I had heard about GVD I had no idea how common it was, or how quickly it can take our best friends from us. Some simple changes may decrease your best friends' chance of this terrible condition happening to them. We can't begin to thank Cate, Marian, Phyllis and everyone at NERR&R enough for bringing another wonderful addition into our family. Ruby brought so much joy and laughter into our lives it is impossible to fully express how much we appreciate the opportunity you gave us to get to know this "senior girl" for three wonderful years. We will have her with us forever. Godspeed Miss Ruby, and thank you for everything you have given us these past three years! We Love You and will miss you until we catch up with you again. Meet Ruby who truly is a gem and big sweetheart . Ruby loves people and enjoys playing ball and playing with toys. Her favorite thing to do is to hang out with her humans and she would love to help you in the yard. Ruby is well trained, has excellent house manners, is crate trained and an easy laid back girl. She loves treats and takes them so very gently. Ruby wiggles with joy when her people come home. 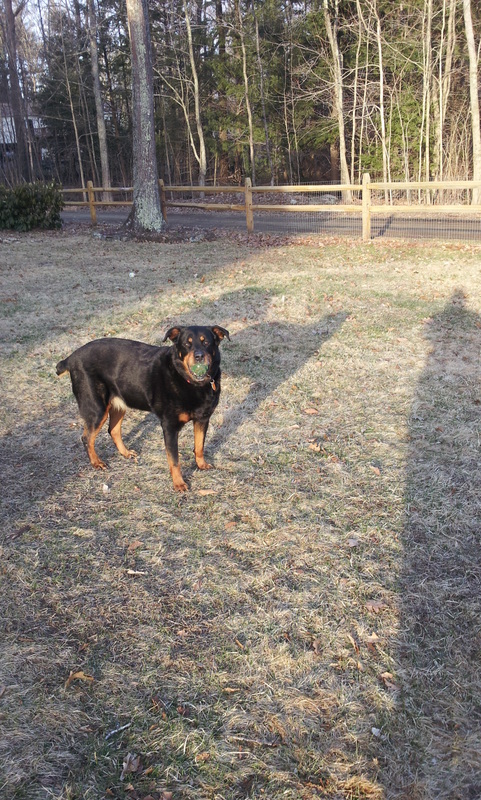 Ruby is good with other dogs, but a home without cats would be best. She will calmly lay at your side in the evening just happy to be around you. She will be 11 in May, but she is very young at heart. Stay tuned as Ruby settles in.